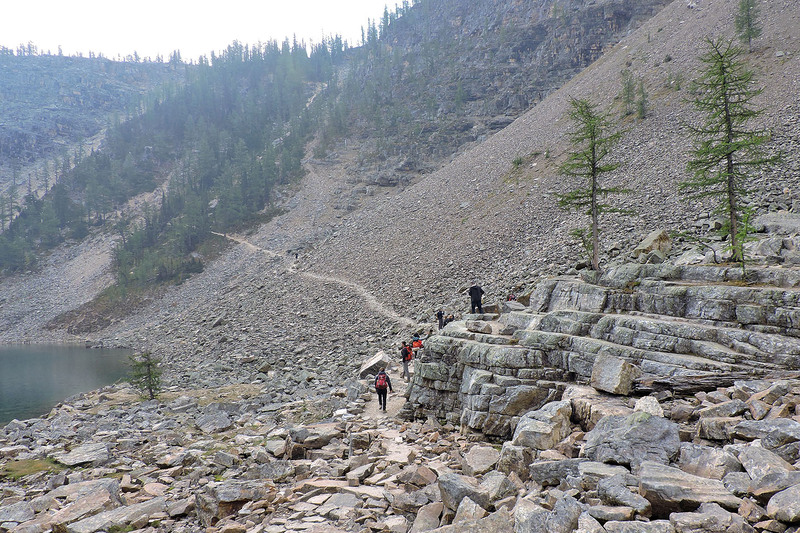 There's nothing devilish about the trip up Devil's Thumb. 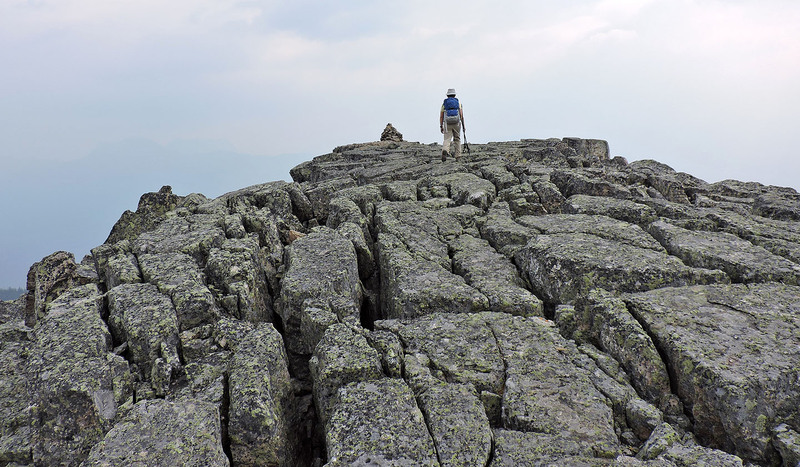 It's mostly a hike with a smidgen of easy scrambling and very mild exposure on a narrow path. 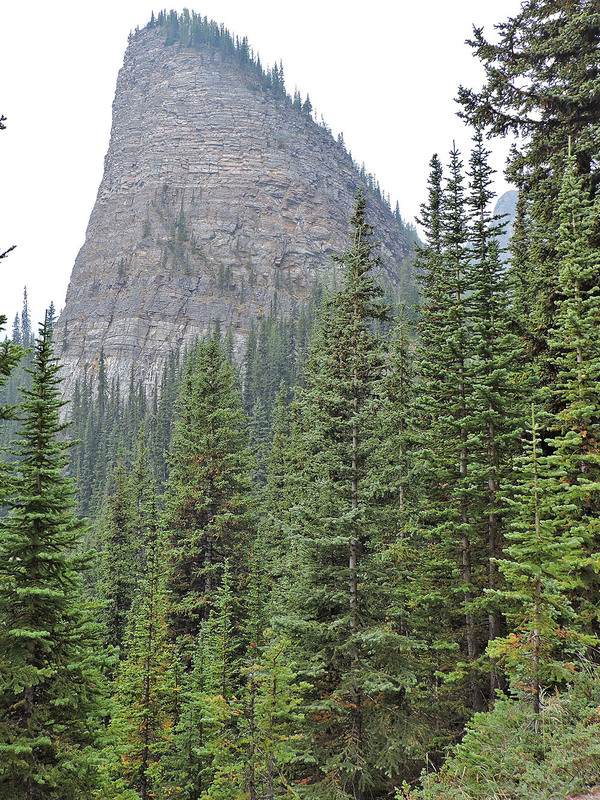 But perhaps that's enough to deter the hordes of tourists we saw on the trail: many ended up crowding Big Beehive which shares a col with Devil's Thumb. We encountered very few people on the Thumb. When Christine, Zora and I arrived at Chateau Lake Louise, it was around 8:30 a.m. and already the huge parking lot was nearly full. 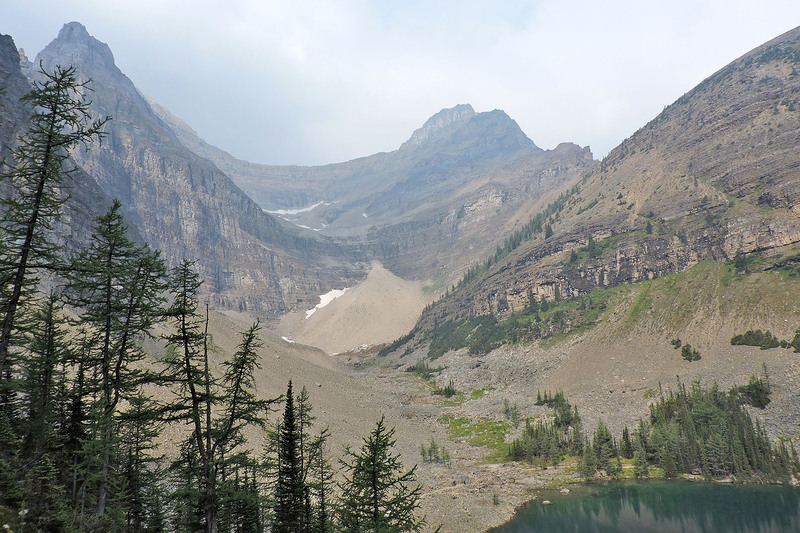 We hiked to Mirror Lake before bearing right and going up to Lake Agnes where we got our first good look at Devil's Thumb at the far end of the lake. 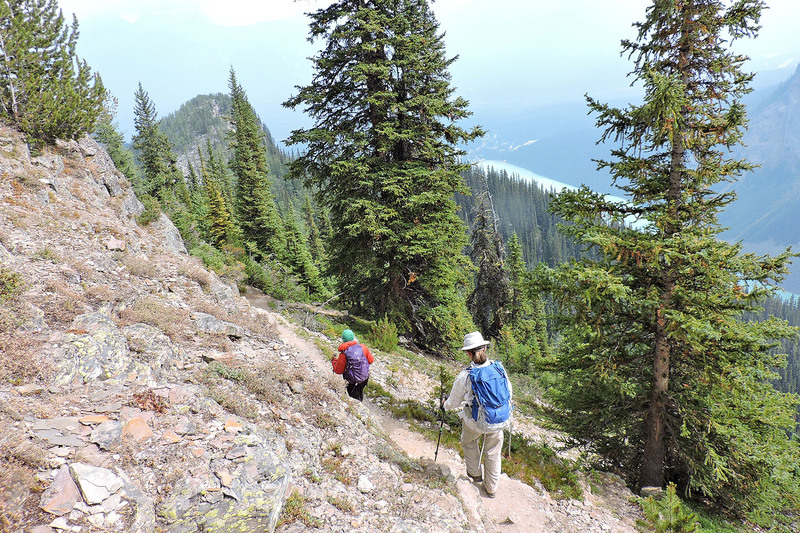 We followed the trail around the lake and ascended the switchbacks to the col: left for Big Beehive and right for Devil's Thumb. 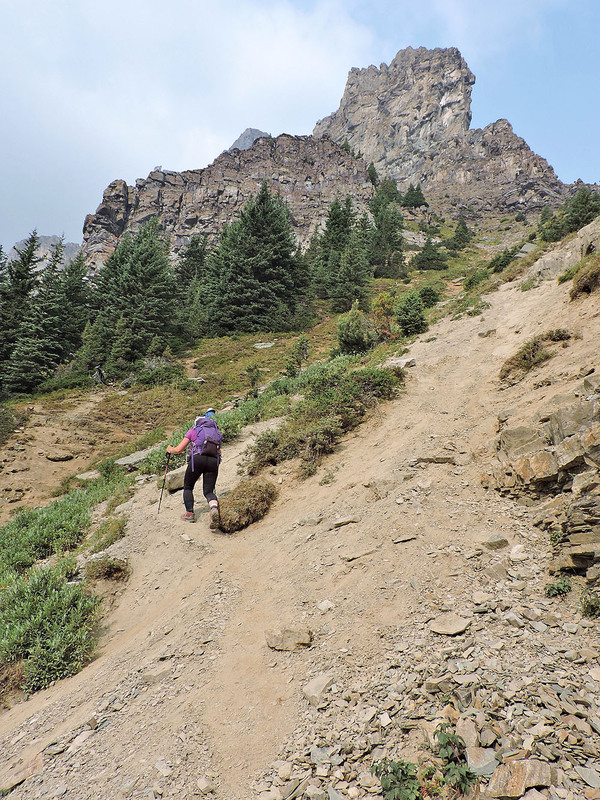 As we started for Devil's Thumb, a hiker joined us. Norman hails from Burnaby B.C. 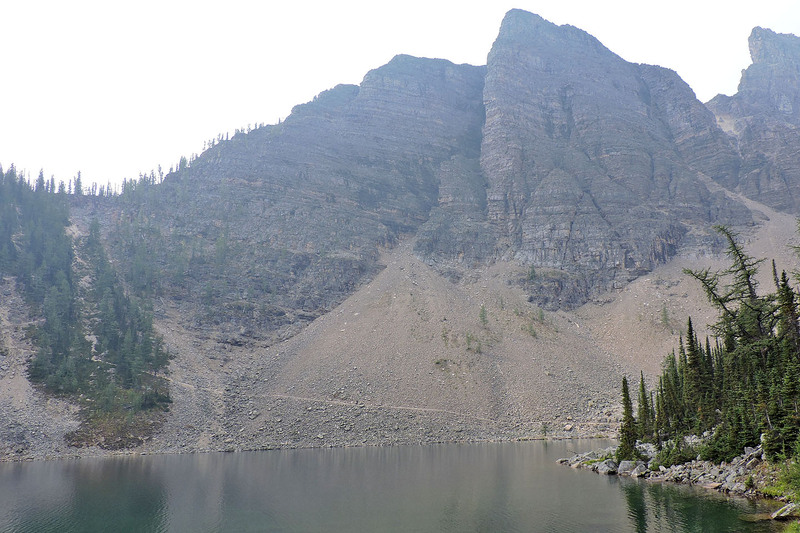 and was spending several days in the Town of Banff, hiking every day. 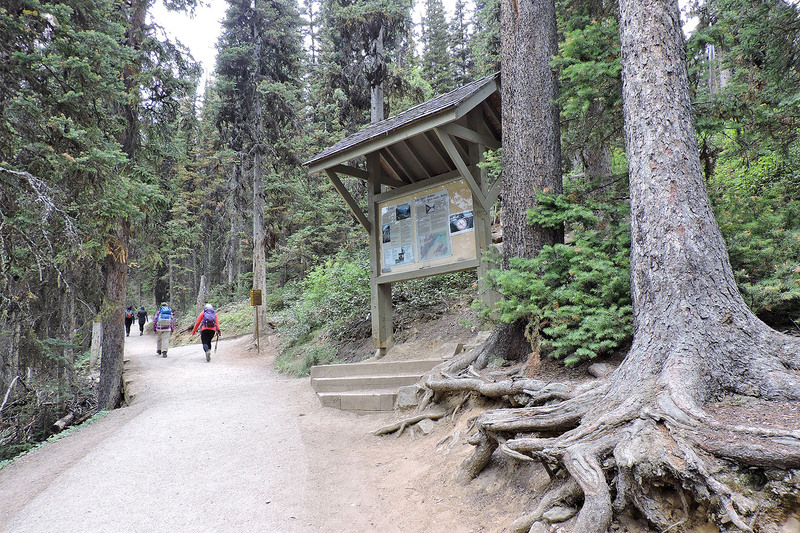 The four of us followed the trail as it traversed to the backside of Devil's Thumb. 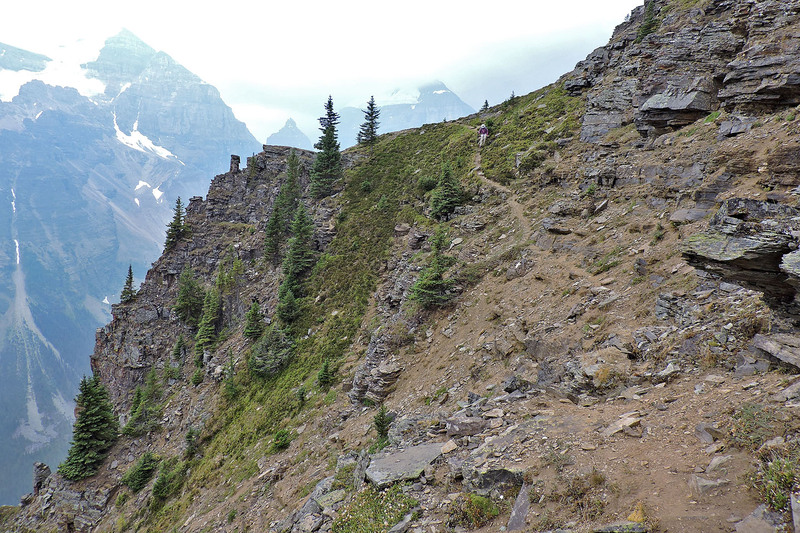 When we reached a steep gully below the Whyte col, we crossed to the other side where a firm trail runs alongside trees before swinging right and climbing to the col. From the col, one can follow braided trails running through the rocks to the summit. 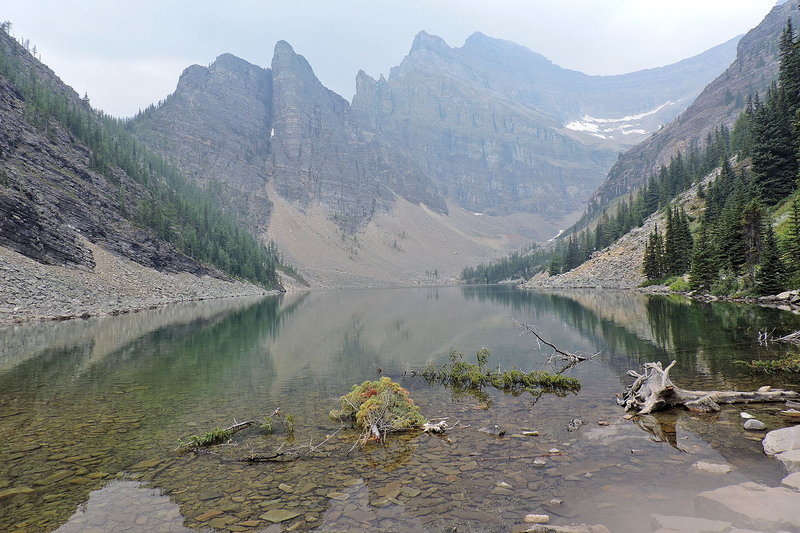 We could only imagine the sights that Devil's Thumb holds on a clear day. 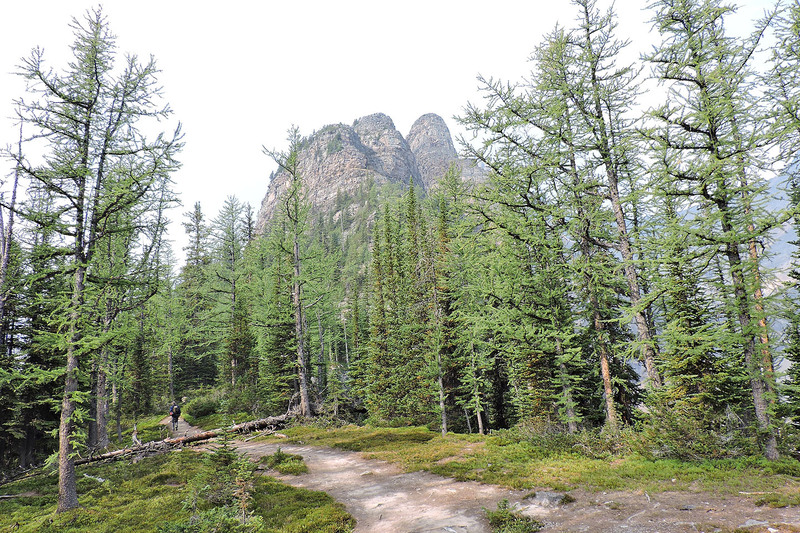 As it was, clouds and forest fire smoke bedeviled our views. 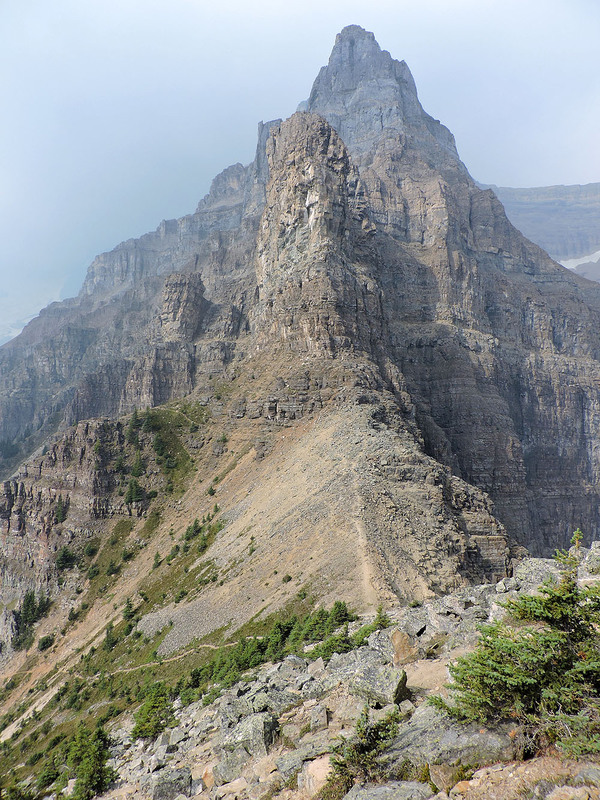 We could see little or nothing of the grand peaks surrounding our modest viewpoint. 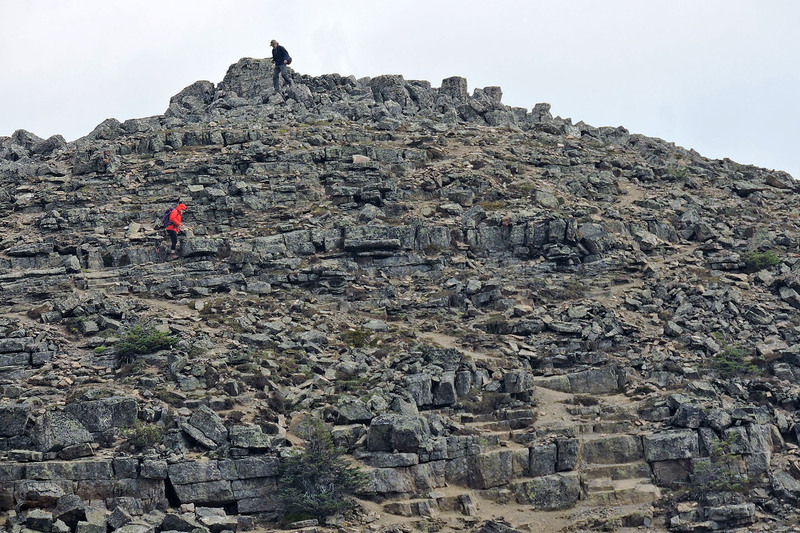 But as we relaxed on the spacious top, what we could see was tantalizing. And for a time, we had the summit to ourselves. 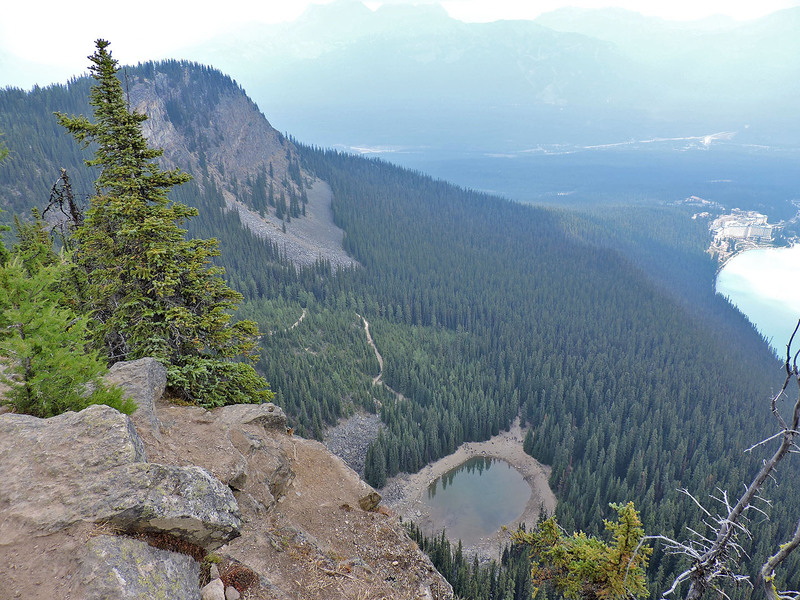 After starting down, Zora and I opted to hike to a viewpoint on the other side of the Whyte col. 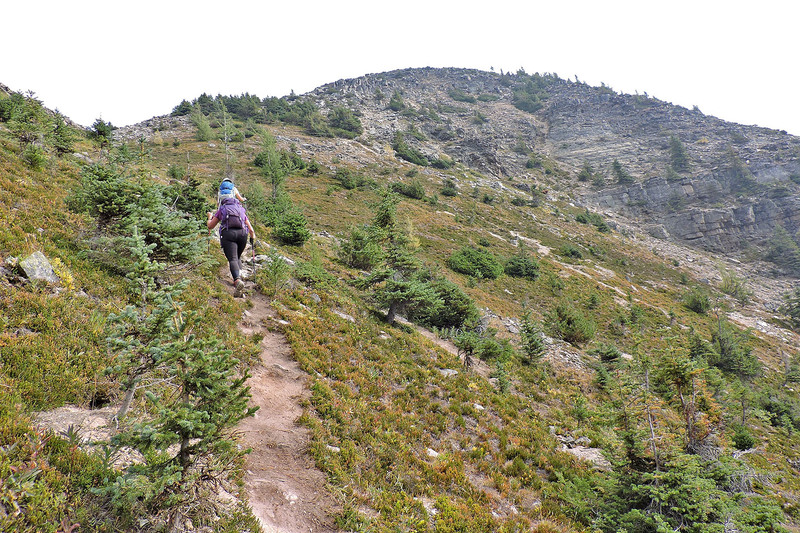 While Christine and Norman hung back, Zora and I dropped down to the col and followed a trail to a shoulder. 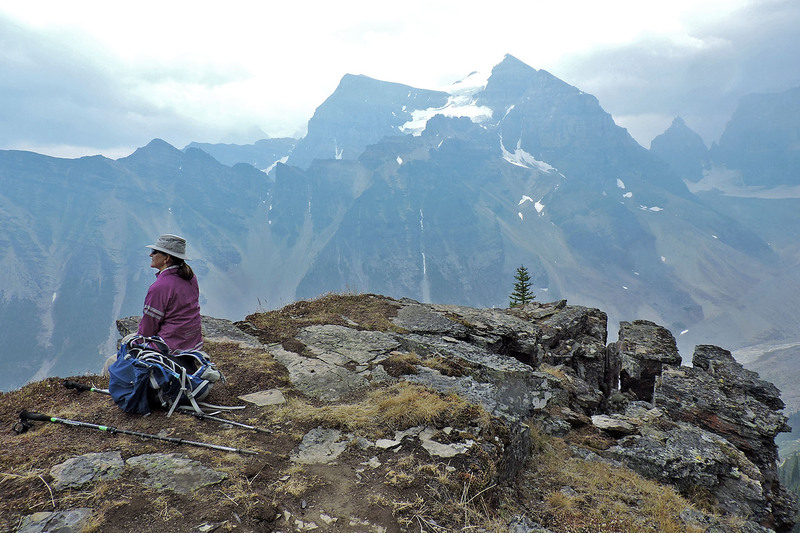 The little viewpoint overlooks the Plain of Six Glaciers, of which we could see almost nothing of because of smoke. 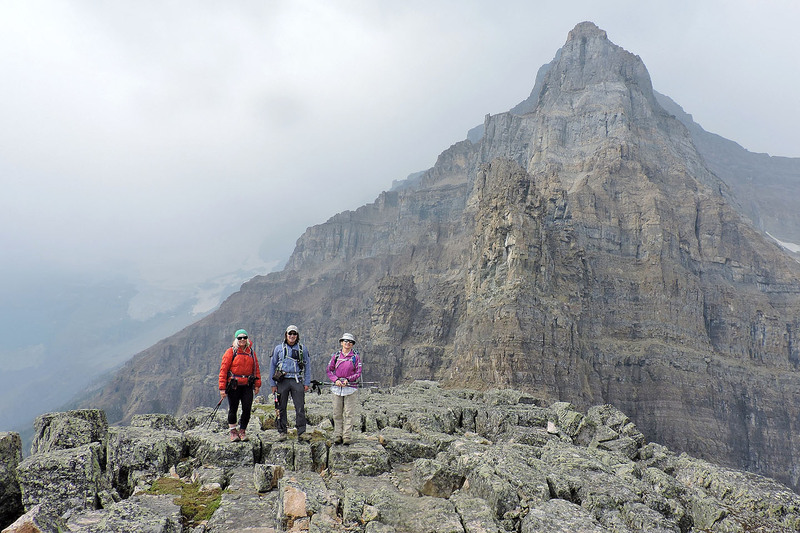 After a time, the four of us reunited on the col and followed the trail back to the Beehive col. We took a few minutes to climb Big Beehive, suffering the dozens of tourists that swarmed it. 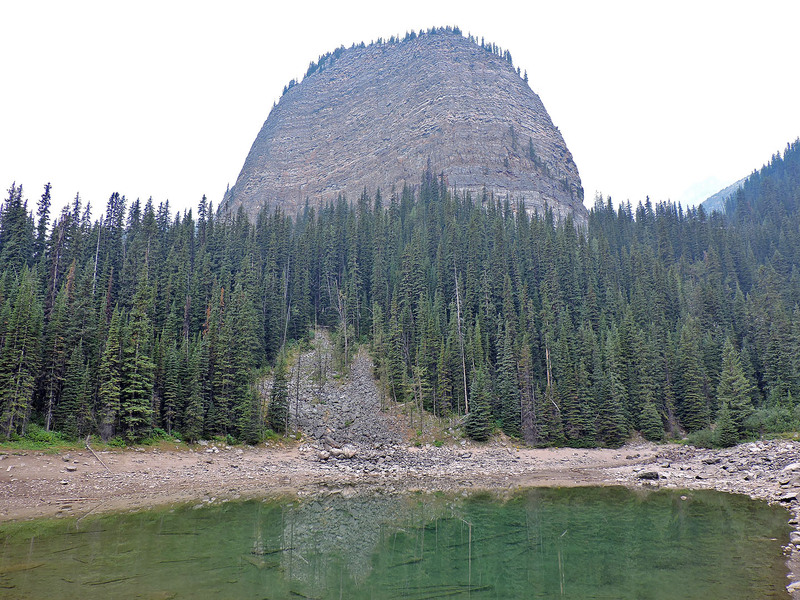 Still, it was worth peering down at Mirror Lake. Then we beat a hasty retreat. Back at the Beehive col, we parted ways with Norman. 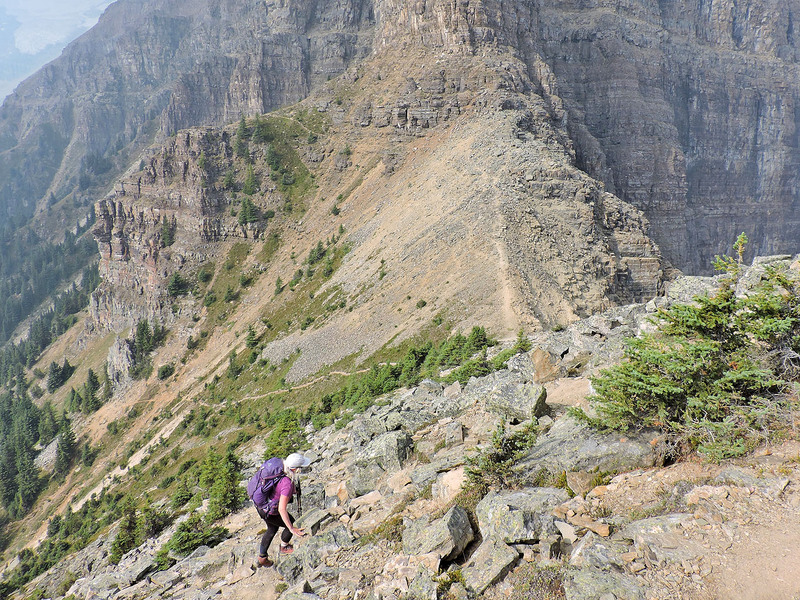 He went on to hike the Plain of Six Glaciers trail, while Zora, Christine and I followed the trail back to the teahouse at the end of Lake Agnes. 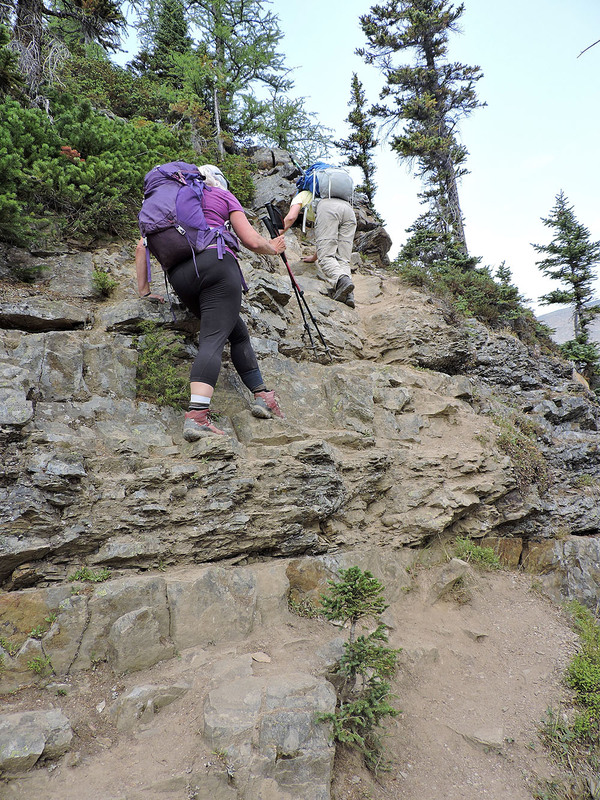 But we opted to take a different path back to Mirror Lake. 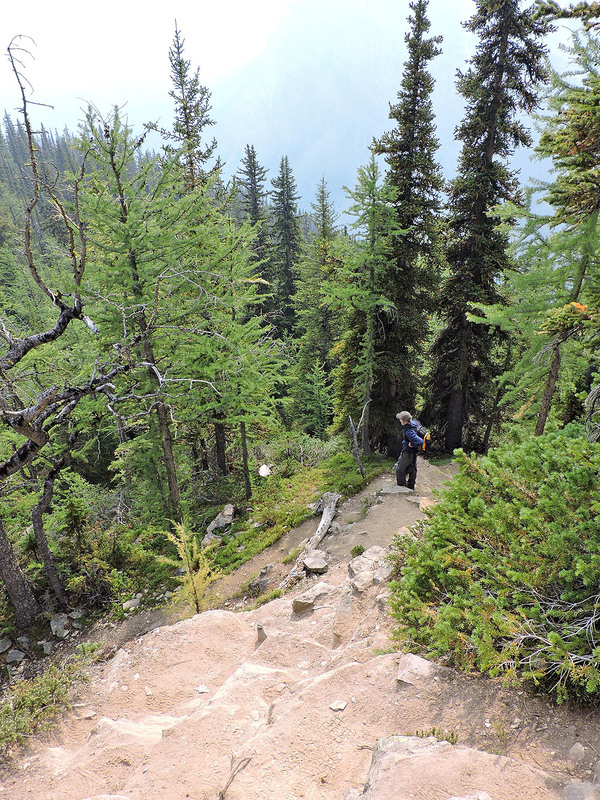 At the teahouse, we kept right and followed the trail where it intersects the Highline Trail. 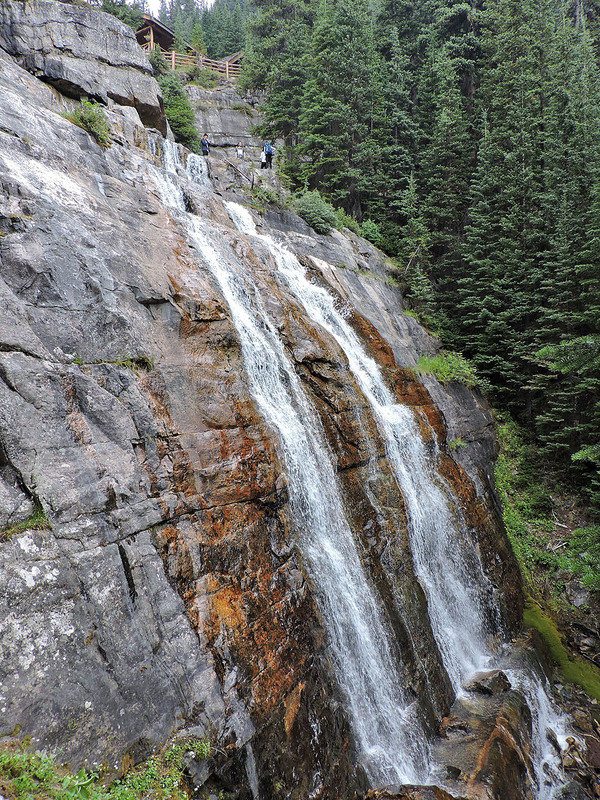 Just below the teahouse, however, we took a side path to view a striking waterfall before continuing on, back along the crowded trail to the parking lot. 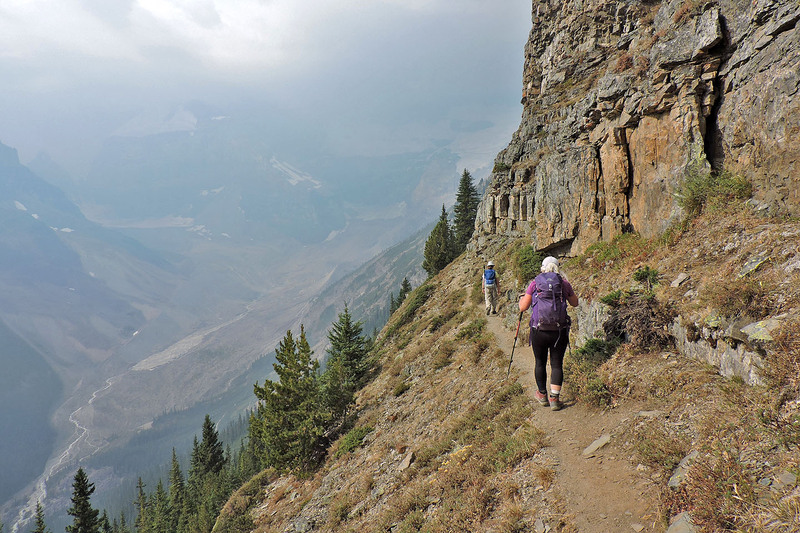 Although clouds and smoke conspired to obstruct views throughout our hike, Devil's Thumb holds enough promise to entice us to return on a clear day. 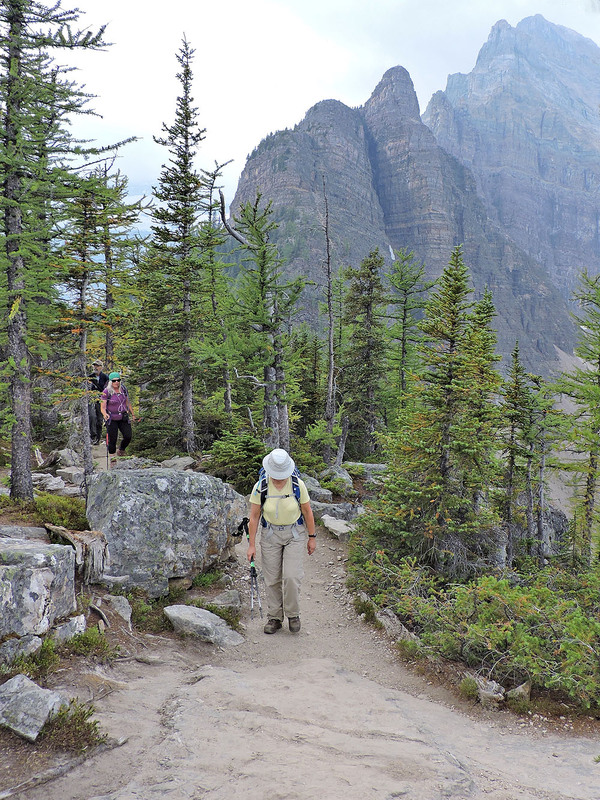 The trail follows the right shoreline to the far end of Lake Agnes. 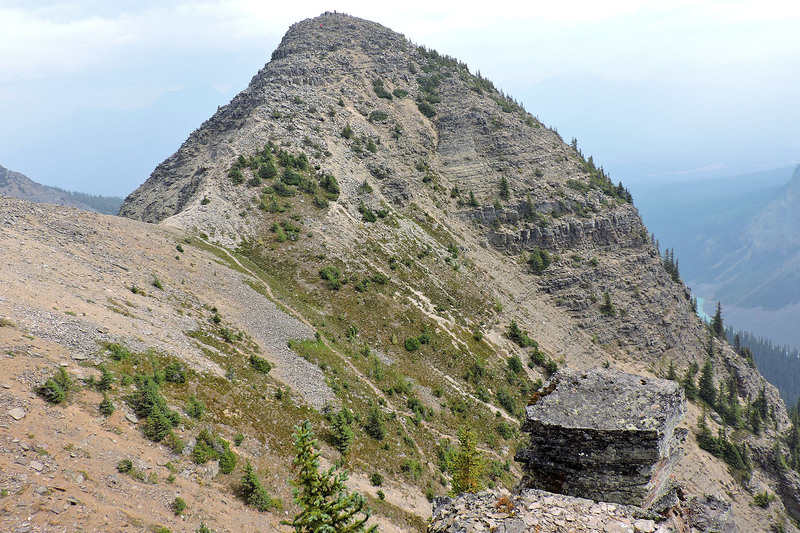 Devil's Thumb is the third point from the right. 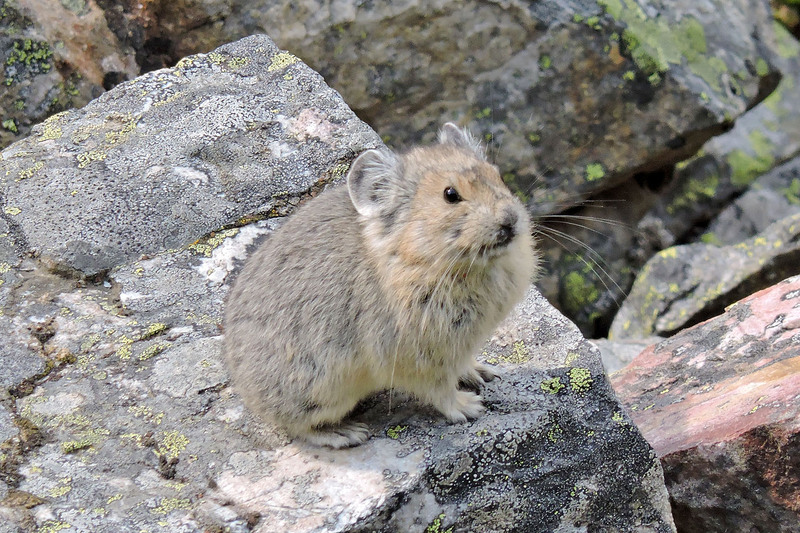 We watched this pika for several minutes as it gathered grass. Here it paused long enough for a photo. 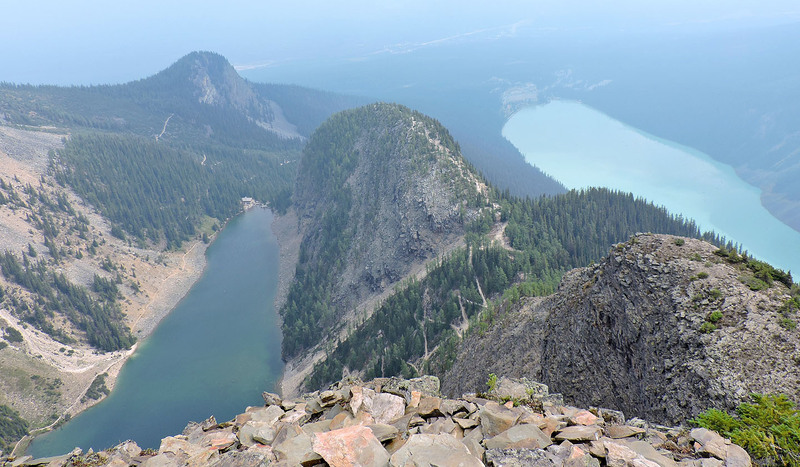 Looking over the edge at Little Beehive, Big Beehive, Lake Agnes and Lake Louise, not to mention the switchbacks we climbed to reach the col.